Sweet Home Alabama: Look what I did today! 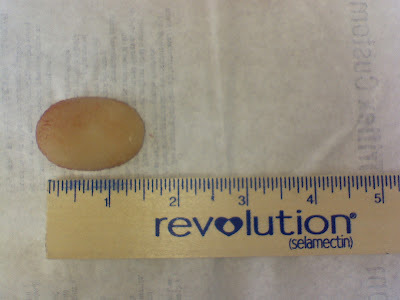 This poor little dog had this bladder stone - for who knows how long? She weighed 10 pounds and this stone was 1 1 /2 inches long. Needless to say, it was the highlight of the day! That is unbelievable!!! You are a life saver, girl! And your cleaning tricks post is a great one. I need all the help I can get! Wow I always thought stone were really small, or at least in humans that is what I have always heard. Poor puppy. What?! That is huge!! Yikes. Congratulations to Scott and Dad!